The ultimate race helmet is now even better, with an included hydration system, MotoGP-developed metal air vents and a wind-tunnel-tested “biplano” spoiler that has multiple wings to maximise aerodynamic performance and add stability at high speed. The 100% carbon fibre shell’s shape is designed to minimise interference with the racing suit, while the interior has an adaptable fit and places no stitching in sensitive areas. 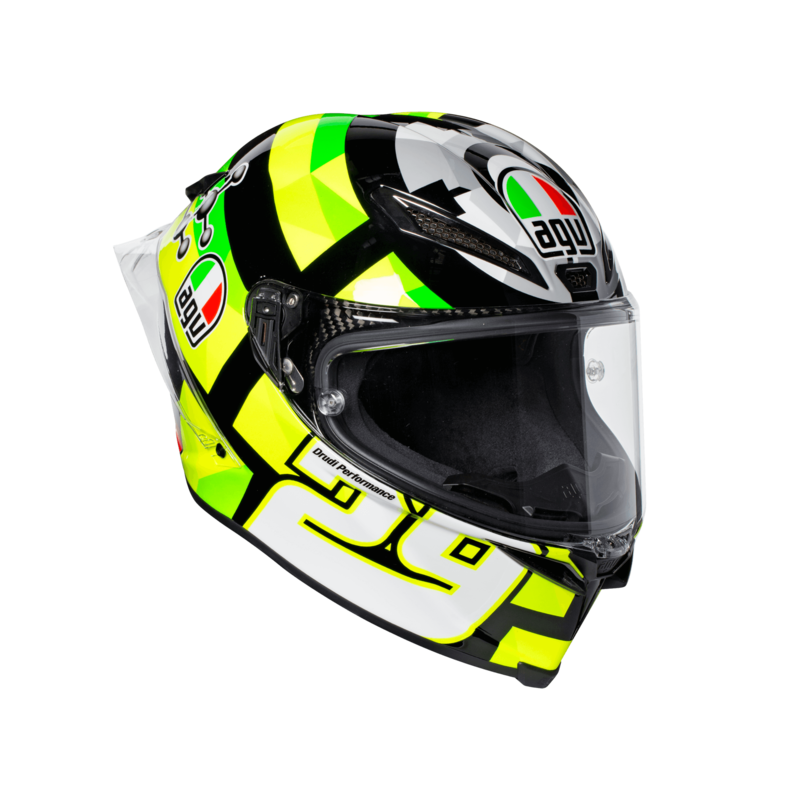 For the 2018 the newly updated designed Iannone replica has been introduced to the range. •Shell in 100% Carbon Fiber engineered in 4 sizes with 5-densities EPS structure developed in 4 sizes. The structure offers an extremely compact and light helmet with unmatched safety performance. • Shell shape is designed to maximize aerodynamic performance and to minimize the risk of impact energies being channeled to the collar bone. Rear shape is engineered to minimize interference with racing suit in racing position. • IVS (Integrated Ventilation System) ventilation with 5 large front vents and 2 rear extractors hollowed in the shell which direct air to the rider’s head. The unique central upper air intake has been strategically placed in highest air pressure point to capture maximum air flow. • New Moto GP developed metal air vents, combines unique strength and protection with an innovative external fins structure engineered to capture maximum airflow in the front of the shell and increase air pressure on the rear exhaust, therefore incrementing the speed of air transition inside the helmet, leading to a higher cooling performance. New internal chin channels distribute the air flow evenly thru the entire visor surface. Vents covers are included in the box. • New wind tunnel tested Biplano spoiler features multiple wings to maximize aerodynamic performance, optimize CX, stabilizing the helmet during high speed riding in any conditions. Biplano spoiler is engineered to detach from the helmet in case of an accident, therefore maintaining helmet’s round shape for increased safety. • Moto GP developed interiors engineered for maximum performance on the track with a patented structure that allows riders to optimize fit and select helmet height positioning over the head. Developed with top riders, the neck roll offers easy entry, maximum ventilation and adaptable fit. Different thickness crown pad and cheek pads inserts are included in the box, allowing the rider to adapt the helmet fit. Removable nose guard and wind protector. • The inner of the helmet is designed to offer the highest riding comfort without any stitches in sensitive areas. All parts are easily removable and washable. • Neck roll: 2way stretch breathable fabric to guarantee the maximum breathability in a lightweight structure, with high strength Nabuk inserts for durable performance. • Cheek pads: soft and gentle Shalimar fabric with Sanitized® (antibacterial protection), 2Dry (moisture wicking) and Microsense (premium skin comfort and wearing fluidity) treatments. • Crown pad: Elastic Microfibre with the same treatments listed for check pads. • New Patented cheek pads safety release system engineered to remove conveniently cheek pads in case of accident. 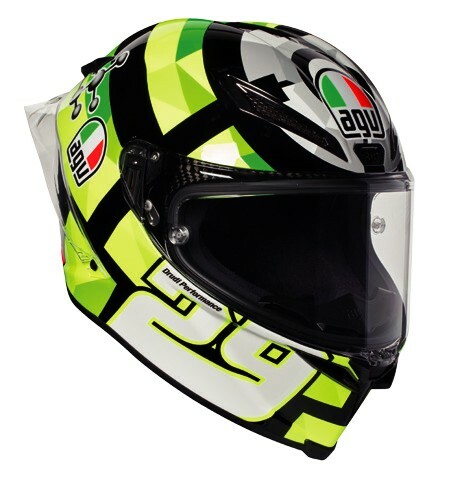 • Moto GP developed hydration system included in the helmet with internal channels engineered for smooth tube placement and drinking valve placed inside the chin of the helmet for a constant and smooth hydration during riding. The system is fully removable. (190°). Visor is anti-scratch and ready for track use tear-off. A tear-off kit is included in the box. • Patented Visor Lock System (VLS) reduces the risk of accidental opening in the event of an accident: visor thickness is from 4 to 5 mm, increasing face and eyes protection in the case of an accident. • Exclusive metal visor mechanism in metal with roto-translation movement achieves total sealing between visor and shell. Tools free rapid visor release system allows the visor to be removed and replaced in seconds. Mechanism is designed to minimize area, therefore supporting peripheral view and impact performance.